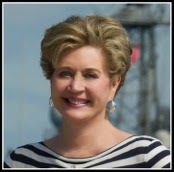 I am so pleased to welcome military romance author Heather Ashby back to The Romance Dish. I had the opportunity to meet Heather in person at this summer's RWA national conference and she's an absolute delight. Heather joins us today to talk about a very special book, her newest release, Never Forget and the importance of helping others. It's a valuable lesson that applies to each of us. Heather is a Navy veteran who taught school and raised a family while accompanying her Navy husband around the United States, Japan and the Middle East. In gratitude for her Army son's safe return from Afghanistan and Iraq, she now writes military romance novels, donating half her royalties to Fisher House Foundation which supports wounded warriors and their families. Never Forget is Book #3 in her series, "Love in the Fleet" published by NY Times best selling author, Teresa Medeiros at Amber House Books. Heather lives in Atlantic Beach, Florida with her husband and two rescue cats. Thank you for inviting me to the Romance Dish, PJ It’s always wonderful to chat with you. I love sharing stories with your readers about romance novels, the military, and life’s lessons. Remember that old Stephen Stills song, “Love The One You’re With?” I’m not here to analyze the lyrics and offer advice to the lovelorn, but I am here to share a valuable lesson I learned recently. Basically, my soul has always known this lesson about helping others, but it was never as clear to me as when the following happened on August 15, 2014. I’m a Navy veteran who writes romance novels set in the Navy with Navy characters. Huh? 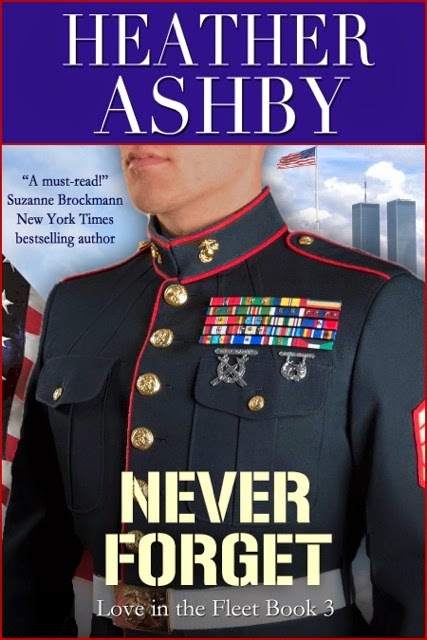 How did I end up with a Marine Corps gunnery sergeant as my hero in Never Forget? I knew very little about Marines—except that they used to guard the gates at Navy bases. Oh, and that my dad was a Marine Corps staff sergeant during World War II. And that he had a globe, anchor, and eagle tattoo on his left forearm with the initials, “USMC” that I used to trace with my finger as a child. And that he had fought in places such as Guadalcanal and New Britain. And he had a Purple Heart medal I used to play with. But most of that was before I was born. I rarely remember my dad discussing the war. It was best left forgotten. Fast forward to 2012 when I began to write book #3 in my “Love in the Fleet” series, Never Forget. 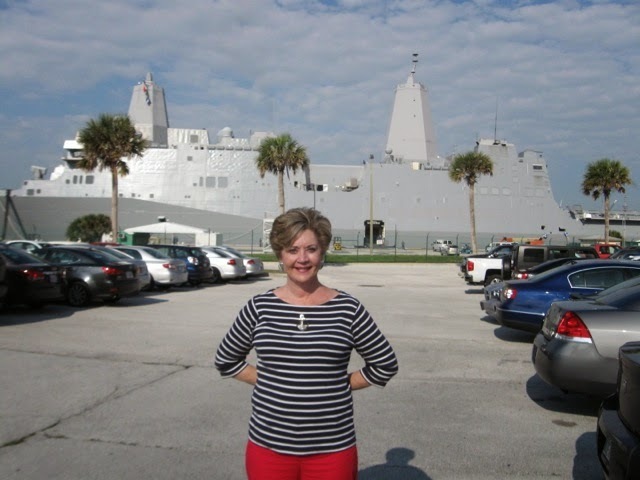 In researching the amphibious assault ships that would be changing home ports to Mayport – the setting for my series – I came across the story of the World Trade Center steel melted into the bow of the USS New York. Eureka! I had an idea. While debating about the right hero for my Royal Navy exchange officer, Gwyn Pritchard, a little voice in my head reminded me that the New York’s job is to transport Marines. Could I do it? Could I come up with enough information about Marines to actually write about one in depth? And who would he be? And what would he be like? My late father flashed inside my head. He was a strong man with a gentle soul, movie star handsome, humble to a fault, and emotionally damaged from a childhood trauma that haunted him his whole life. Throw in some unresolved war-time PTSD issues, and you have the classic wounded hero. Although my dad was brilliant, creative, and successful, he suffered from depression and always carried an element of sadness about him—as if he didn’t deserve to be happy. My heart ached for him and I spent many years wishing I could make things right in his life. Wished I could heal him – which, of course, I couldn’t. But I can heal a character in a book. I gave my hero, Gunnery Sergeant Adam Connor my dad’s back story. And I cannot describe the joy it is giving me to heal Adam in Never Forget and Unforgettable! (March 2015) And to work with a Marine Corps advisor, who not only helps me write these books authentically, but also tells me that sharing Adam’s journey may be the catalyst for other Marines to seek healing. (Most troops with combat PTSD are male. Most romance readers are female. Most males who seek help for PTSD are guided to do so by their wives. You do the math.) I love seeing anyone healed from anything in whatever way they can do it! The school teacher/daughter/mom in me—who wants everyone to be happy—was all over that! I read an advance copy of his book, commented, and offered suggestions when I realized he could use some advice on marketing and promotions. Shawn and I have spent hours chatting, both online and on the phone. He is a strong man with a gentle soul, deeply patriotic, and humble to a fault. Reminded me an awful lot of my late father—the Marine, who went on to be a writer with a career in public relations. And what’s that? Now I have an opportunity to guide this young writer with his marketing? As I was digesting the fact that I was unable to help my dad—the Marine staff sergeant—heal in his life, but I’m able to help this young man—also a Marine staff sergeant—share his story of healing that can be a catalyst for other Marines to heal, I sat back in my chair, stretched and noticed the calendar on the wall. Twenty-five years to the day that my dad passed away. And that’s when the tears flowed in earnest. Great buckets. I could practically feel the warmth of my father’s smile—no longer tinged with sadness—as he watched over Shawn and me in that moment of perfect kismet. This was the day I truly got it. The day I could actually put into words what I have done for most of my life; as a mother, as a teacher, as a human being: We can’t always help the people we want to help in this world, but we can darn sure help somebody. Thank you for letting me share with your readers, P.J. I would love to hear their stories of how they’ve helped someone out – sometimes “in honor” of somebody else. I have a copy of Never Forget for one lucky commenter. Thanks for joining me today, readers. And thank you in advance for your acts of kindness that help make the world a better place. than the sailors and Marines stationed there? And what if those souls can help the troops defeat al-Qaeda this time? 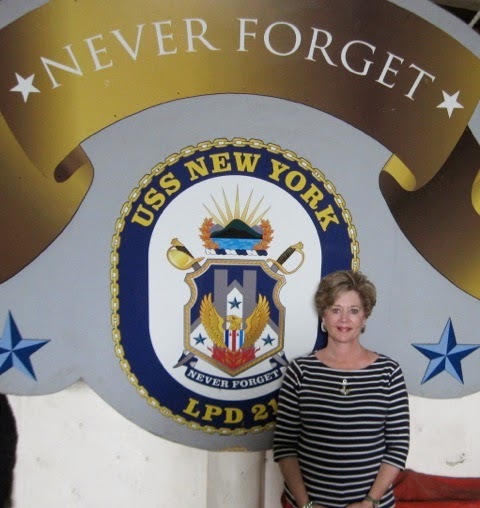 When Royal Navy officer Gwyn Pritchard reports for exchange duty aboard the USS New York, she’s the only person who sees 9/11 spirits roaming the decks. The daughter of a famous Welsh psychic, Gwyn learns they must complete a mission in order to pass to the other side. For a "behind the scenes" look at the inspiration for and creation of Never Forget, check out Heather's September 11th interview with Kim at SOS Aloha. So true, Helen. Sometimes people just need somebody to listen to them. Actually, that is often what happens in a therapy setting: Once a person gives voice to the turmoil inside them, they are able to see the situation more clearly and can proceed from there. Thanks for being such a good listener. God bless you. Helen, a good listener is worth their weight in gold. I'm sure you are much appreciated by your family and friends. What a touching story about your dad and the parallels between him and Shawn. Knowing where you get your inspiration from definitely gives your book even more depth for me as a reader! As a teacher, I think each student that I help allows me to share in the joy of learning and aiming towards a brighter future. You are so right, Catherine. Teachers are blessed with the opportunity to change so many lives, often just by believing in their students. And how lovely to be able to share in their joy of learning. I know you change lives in your classroom. Your students are fortunate to have such a loving, caring teacher such as yourself. Thanks so much for inviting me today, PJ. (And yes, it was WONDERFUL to finally meet you at RWA in San Antonio!) I'm excited to chat with your readers today. And thanks so much for mentioning the 9/11 posting on SOS Aloha yesterday. Write on! Welcome, aboard, Heather! I'm about halfway through Never Forget and loving it. In fact, if I weren't here chatting with you and our readers I'd be back on board the USS New York finding out what happens next! Just what every writer wants to hear, PJ. It's music to our ears. Thanks for reading and I hope you're enjoying it. Thanks again for letting me share it with your readers. That is all it takes sometimes is having someone to listen, let you vent or whatever you need. As always, thank you to the military and their families for their sacrifices. So true. Having someone to listen is pure gold. Thanks for stopping by, Patoct. What a wonderful story. I would like to think your father had his guiding hands in a way. Knowing how much you loved him and he loved you. Thank you for sharing, shipmate. Thanks for stopping by, Loni. I agree with you. I think Heather's father most definitely had a guiding hand. Now you're making me cry - again - Loni. I KNOW my dad has his hand in this. And I know I was meant to write him into my Adam Connor character so healing can take place. NOW, if ONE Marine out there heals because of what he reads in Shawn's book or mine, we know our mission will be accomplished. Thanks for your support, shipmate. Heather, you are amazing, and I loved reading this post about your father. I know how much inspiration you drew from him. And it brings back memories for me of the one time I actually met him. I won't forget that ever. I can't wait to read Never Forget. Yesterday, 9/11 is such a sad day and it is so important to NEVER FORGET! Thank you for joining us today, Sandy! Aloha! Thanks for remembering our veterans! I send boxes to deployed personnel with the support of the Romance community! Hi Kim! Thank you (again) for all you do for our military families. As the widow of an U.S. Air Force veteran with many friends in the military community I know how much the efforts of people like you mean to those serving abroad and at home. Readers, Kim runs the SOS Aloha blog that I linked to in Heather's post above. Welcome, Shawn. First - and most important - thank you for your service and sacrifice. PTSD is indeed a critical issue facing our military. How wonderful that writing is helping you deal with this monster and that, through your writing, you may have the opportunity to help others. Best wishes for the upcoming publication of 500 Miles an Hour! Where do I begin, Shawn? You have touched my life so much in the past few months. Your book, 500 MILES AN HOUR, is going to be so successful! I'm not talking about sales. That would be nice, of course. But I'm talking about healing. So many Marines and soldiers are going to benefit from your novel and if I can direct any attention your way, I'm in! God bless you, dear. And WRITE ON!!! PJ, Do you SEEEEE why I adore this young man? I am so happy to help out in any way I can, Shawn. God bless you! My dad was in the RAF during WWII and for years nightmares of that time would haunt his dreams. So I know how you felt about your dad. I also have a friend who was in the marines during the Korean war and he was a drill Sargent. Looking at him you would think he was a tough guy, but he is gentle and has a heart of gold. Great story and I am looking forward to reading your book. And good for you taking this young man under your wing and guiding him on his journey as a writer. One of my uncles was in the Army and spent four years serving on the ground in Europe during WWII. I don't think those memories ever left him. God bless your family for their service, Kathleen. If I'm reading that your dad was Royal Air Force, you may really enjoy NEVER FORGET since half of the book is about the Royal Navy/Marines. The idea was given to me by a delightful Sub-Left-tenant in the Royal Navy. And I may have worked her into the book :-) As to taking Shawn under my wing, I am so blessed to learn so much from him! I know what you mean, Teresa. My late husband served 20 years in the Air Force which is one of the reasons Heather's military characters and her heartfelt writing call to me. And in one of those kismet moments that I didn't think about when scheduling today's blog, today would have been my husband's 82nd birthday. I like to think he's up there in Heaven hoisting a few with his fellow comrades-in-arms. Teresa, Bless your dad and your family for their service, because when one family member serves, the entire family serves. Thanks so much for all you've done for me at Amber House Books to get my books and their messages out there! PJ, I noticed your Facebook post announcing this was your husband's birthday and I, too, thought of the kismet involved. We are thankful for his service and I send extra blessings to you today. I'm glad you do that, jcp. The world would be a better place all around if everyone remembered to that like you do. God bless you. Thank you for sharing such a personal story, Heather. I know your book will be responsible for healing others. We talk about "books of our heart" ... this truly is a book of your heart and soul. Thanks for understanding that, Sheri. We DO have stories inside of us that cry to be told. I know you definitely do after all your years as a caring ER nurse. I can't WAIT to read them! What a wonderful story Heather. Thanks so much for sharing your inspiration with us and all your readers. Looking forward to reading Never Forget. God Bless you and family for all your service to keep us safe at home. Aww, thanks, Suzanne. Blessings to you and yours. Thanks for stopping by. Always good to see you, bn100 :-) Thanks for stopping by. Military life is something special. It isn't for everyone. Family life is determined by the mission. We decided shortly after getting married that we would celebrate when we could. Christmas, birthdays, anniversaries, etc. are more than just dates. They are a celebration of something special, and that celebration can be held at any time. We delayed Christmas for a week, when the children were little. I got involved with Family Services on base partly because of my mother-in-law. She was instrumental in getting it started on the base when my husband was little. (he was an AF brat and we were stationed at the base where he grew up) Knowing how hard it can be for the younger enlisted to make ends meet, I got a layette program patterned after one at another base started through Family Services. It was only for E-1 through E-3 and was just a little bit to help them get started. Military communities come together to help each other out. Everyone knows they could be in the same situation at any time. My husband retired in 1992 and we both really miss the community. Our unit gets together every 2 years and it is something everyone looks forward to. Both of us keep busy with volunteering for the Red Cross and working with their SAF (service to armed forces) programs, at the local VA hospital, and with the Honor Flight Program. It is the least we can do to honor those who made our country what it is and those who are sacrificing to keep it safe today. Thanks for sharing, Pat. And thanks to your family for your service. "When one family member serves, the entire family serves. LOVE that you were stationed at one of the bases where your husband grew up! Love the idea of the layette program too and thanks for all your volunteer work, continuing today. I enjoy working at the USO at our airport, helping to pay back just a little of how they took care of us when we were a traveling military family. You are so right. The military is special way of life. Military is family; it's that simple. Wherever, whenever; they are there. Glad you're able to get together with your unit every other year. Family reunion, right? :-) Blessings to you and yours. We stopped by to see friends in Alabama. They hadn't been able to make the reunions, so we hadn't seen them in about 15 years. Their neighbor couldn't understand how they could have someone stay over that they hadn't seen in so long. They told here it would be like we had had just seen each other last week. It was. You are so right, the military is family, especially a small unit like ours. But it goes beyond that. Whether you know each other or not, you understand each other and know how to help each other when needed. You made me think of my father. He served during WWII. He died last year on ANZAC Day. (ANZAC - Australian New Zealand Army Corp - dates back to WWI.) ANZAC Day is our day to honour and remember those who served & those who fell. A fitting day for a Serviceman to die. My point being, I guess, that he was an amazing man & I strive each day to live as he lived & taught me. YES, Mary, what a day for a serviceman to pass on! My writing Critique Partner is Australian, so I am familiar ANZAC Day. God bless your dad and God bless you for honoring him by striving to live the way he taught you. I love reading about our military heroes. Like Mary, it makes me think of what my father has been through. He served in the infantry under General Patton, he was in Korea & Viet Nam. He retired at 48 yrs. old with over 30 yrs. active duty. My husband was in the navy during the Viet Nam era but not stationed overseas. One of my grandson's is in the army. I worked in Military Pay for about 18 yrs. and I miss helping the military. I enjoy reading books by the authors that honor our military members, active and retired, and those that served in any compacity. WOW! I'm loving hearing from my peers whose parents served in WWII and beyond! God bless your family for their service, Pat. And yes, to enjoying working with the military as a civilian. Thanks for taking such good care of our troops for those 18 years. I hope you'll give my books a try. I had such good military advisors help me keep them authentic. Thanks for stopping by, Pat.